Leaves: Cauline, opposite, simple; stipules absent; petiole absent; blade spatulate, obovate, oblanceolate, lanceolate, ovate, or elliptic, .2 to 1.4 inch long, .08 to .7 inch wide, tip rounded to acute, margins entire or toothed above. Inflorescences: Racemes, terminal, flowers appearing axillary. 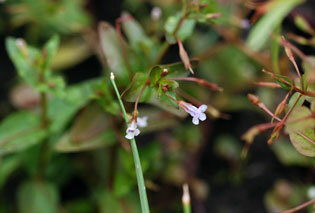 Flowers: Pedicels thread-like, spreading, to 1.2 inch. Flowers: calyx 1/12 to 1/4 inch, sepals 5, fused basally; corolla white, lavender, or light purple, 1/8 to 2/5 inch, 2-lipped, lower lip deflexed, 3-lobed, upper lip erect, shallowly 2-lobed; stamens 2, included; staminodes 2; style 1; stigma 2-lobed. Fruits: Capsules tan, ellipsoid, .05 to .28 inch long; seeds pale yellow, angled or ribbed, tiny. Comments: Lindernia dubia is extremely morphologically variable. Genera of Linderniaceae traditionally have been included in Scriphulariaceae. Named for Franz Balthasar von Lindern, French botanist.